This international, multidisciplinary journal is aimed primarily at members of the helping and teaching professions. 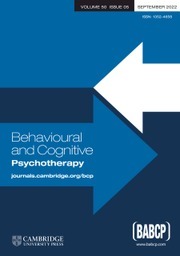 It features a broad scope of original research papers in both experimental and clinical work contributing to the theory, practice and evolution of cognitive and behaviour therapy. Under the guidance of an international editorial team, the journal reflects on and influences developments in its field, encompassing most areas of human behaviour and experience, and representing many research methods from randomized controlled trials to single-subject experimental designs.